Not only is train travel hot again, but Amtrak is getting their rear in gear around accommodating 2-wheeled tourists. This blog post is dedicated to the love (and gripes) of train travel, Bikabout's favorite routes, which routes are bike friendly and train travel tips. Boarding the Empire Builder in Leavenworth, WA. 21 Sept, 2016 - It finally happened! Amtrak added "Trainside Checked Bike Service" to major long distance lines, Northeast Regional, Lakeshore Limited, Empire Builder, Coast Starlight and many more! 4 May, 2016 - This week was huge for "bikes on train" announcements! Both the Vermonter (DC-New York-Springfield-Burlington) and Hiawatha (Chicago-Milwaukee) now have roll-on service. + WHY TAKE A TRAIN? TAKING A TOUR OF THE BEST AND WORST OF AMERICA We greatly enjoy watching the scenery roll by out the windows, often through parts of cities that you normally don’t get to see. You can look forward to fascinating and tragic urban decay in Baltimore, soaring bridges and train-only tunnels along the eastern seaboard, rolling hilly farmland in Virginia that’s so picturesque it hurts, massive rust-colored industrial compounds in northern Indiana that are straight out of Mordor, endless pastoral grasslands in the Dakotas, a very long tunnel right through the Cascade Mountains east of Seattle, and a properly long run alongside the Puget Sound as you go north from Seattle to Vancouver. LONGER TRIP TIMES BUT LESS CATTLE HERDING As a mode of travel, the train has some compelling aspects going for it. It has the same “someone else is driving” aspect as flying, where you aren’t responsible for much beyond showing up on time at the beginning. Once you’re aboard, you can kick back and tune out, or devote your full attention to your family instead of other drivers, exits, traffic, navigation, etc. Trains also don’t force you to arrive hours before departure so that you can participate in the comically pointless security theater review that is the TSA. No one forces you to go to second base before allowing you onto a train… show your ticket, walk on, and find your seat. Trains are also more environmentally friendly than other long distance travel modes, which matters. 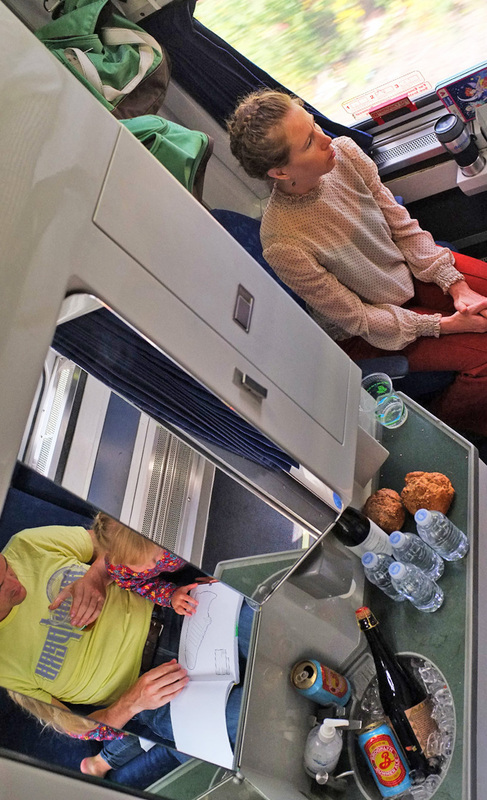 THE SLEEPER CAR EXPERIENCE When we think about the best train trips we’ve taken, what we’re really remembering so fondly is our time in the sleeper cars. Having a private room to yourselves with curtains, a sink, two massive comfy seats, and a picture window to look out makes the trip go by almost too quickly. Cooling down a bottle of something good in the sink and slowly sipping it as upstate New York unfolds before you is light years better than driving yourself, much less flying. THE GRAND STATIONS Finally, we love stepping off the train into some of the more grand train stations that survive from an era that prioritized rail, and elevated it to a truly first-class way of getting to new places. Cities vied to out-do each other impressing arriving travelers with their central train stations – about which we could probably do an entire blog post. Some of them escaped the wrecking ball and some sadly didn’t (pour one out for Penn Station, y’all), and the survivors are there waiting for you today to remind you how nice travel ued to be. The best of these buildings are soaring public cathedrals, and stepping into their atriums full of oak pews and antique clocks cannot fail to put a smile on your face that would never happen at Laguardia or Hartsfield-Jackson. + WHY TAKE YOUR BIKE ON THE TRAIN? Recall that unlike airports, train stations make pretty good neighbors. 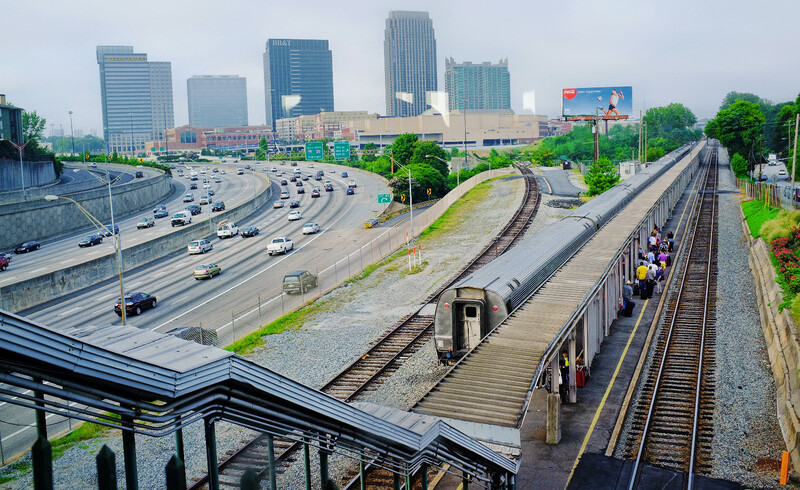 They’re perfectly suited for being right in the center of a city, which means that when you arrive by train, you’re almost always starting off in the middle of everything. Hopping on a bike right at the station is ideal, and what better bike to hop onto than your bike? Pack for the trip in panniers, so you can just click them onto your bike and start having fun instantly. Depending on the layover length, sometimes you can hop off and go grab some food and drinks while you wait, too. We’ve had some wonderful meals in New York City and Seattle this way, biking perhaps a mile away during a 2 to 4 hour layover to grab a bite and a beer, then biking back full and happy for the next leg of the trip. Typical roll-on service that Amtrak refer's to as "walk-up checked bike service". This sometimes requiring you to lift the bike from the floor to the baggage car door, which is fine for carbon fiber folks, but not for city bikes. DELAYS Depending on the route, you might be sharing the tracks with freight trains who actually own them and lease them to Amtrak. Part of that arrangement is that the freight trains get priority, meaning that the Amtrak train will pull over and wait for a passing load of grains, coal, etc. This means that on those routes, delays are common, and are often multiple hours total. 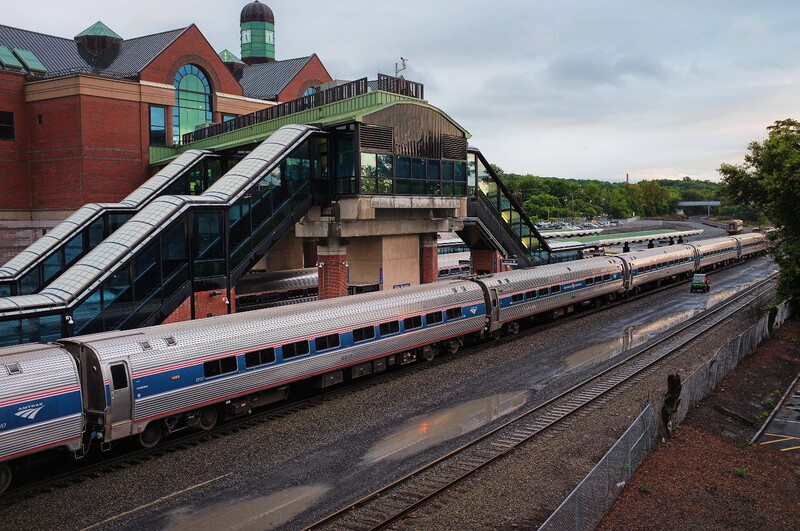 Other routes in places like New England, where Amtrak has priority, don’t have that problem. FOOD A second issue is the food situation. 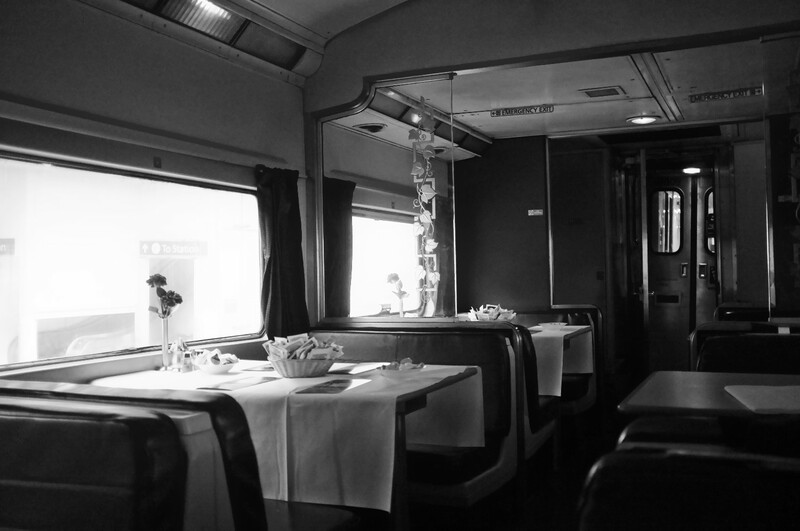 Most routes will have a dining car - if you get a sleeper car, for example, the meals come with your ticket. The choices are somewhat limited, however, and the food is not particularly fresh, so passengers with dietary restrictions or very high standards may want to bring their own food. 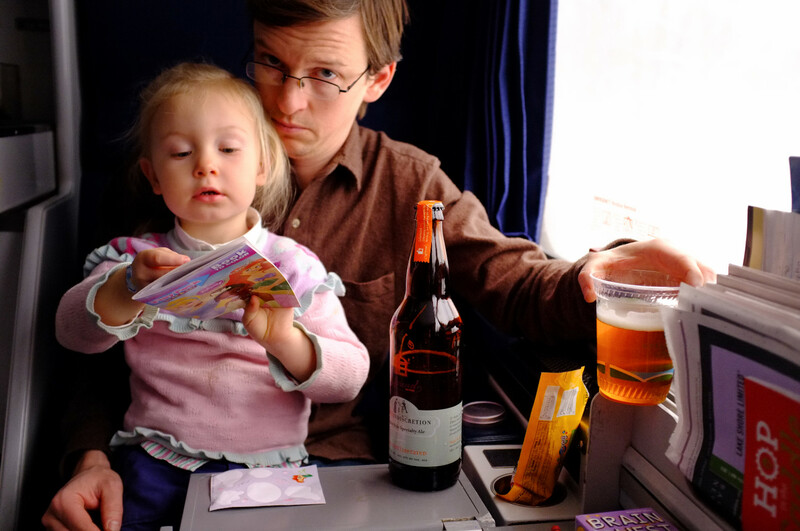 The dining cars also have limited beer and wine, with west coast lines actually having pretty good beers, sometimes. EMPLOYEES Amtrak employees are union, and some of them are wonderful, helpful people. Some of them, however, are punching a clock and tolerating you as a means to a paycheck and eventual retirement. The downside to job security is that people who really ought not be anywhere near a customer service role can continue to keep those jobs long after giving up any pretense of caring. And as with so many things in life, it only takes one to ruin your day. 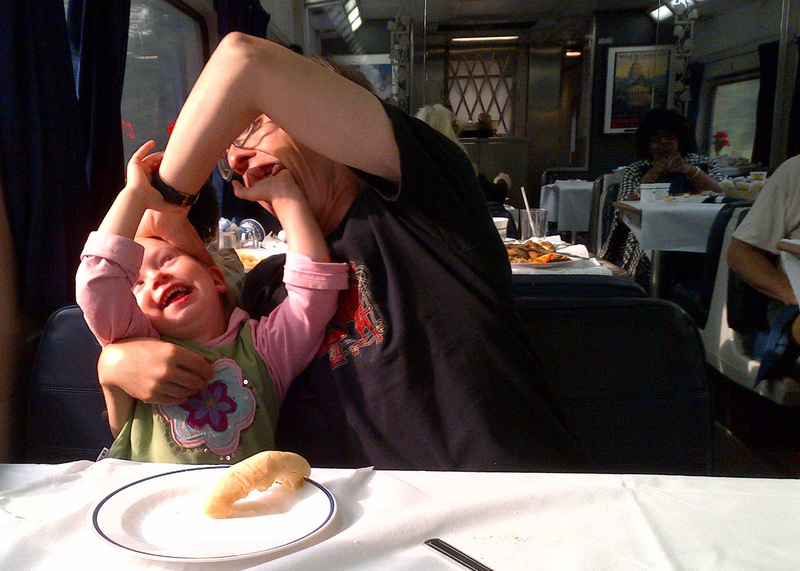 If we had to make sweeping generalizations, we would say that the sleeper car conductors tend to be absolutely excellent, the main seating car conductors are average, and the dining car tends to attract bitter lifers with 6 more months to retirement. Thus, the less you need to interact with them, the happier you may well be. Similarly, some conductors still recall the days when “no bikes” meant “no bikes,” even though folding bikes are now allowed to be stashed just like any other luggage (much of which is a lot bigger than a folded bike, by the by). There are stories of lone wolf train employees who don’t know their own policies making trouble for folding bike owners, so if you have a cover for your folder, it might be a good idea to cover the bike, and to keep a close eye on it. LIMITED SCHEDULES Many lines leave once a day, which is just the nature of limited demand, but it will force you to conform to a rigid timeline on departure. Nobody beats the car in this respect, where you get to leave the second you feel good and ready. THE MAZE-LIKE STATIONS Some newer stations are honestly laid out terribly. Penn Station in particular is a stunning example of how to confuse and anger the common traveler wth design choices. If you are going to have to get on or off the train at one of these stations, you need to plan on having extra time to search for maps, then try to decipher any maps you get lucky enough to find, and then, of course, ask a string of people for directions. Old stations and smaller stations tend to be easy, but the bigger new ones can be a serious challenge to get through for the first time on a tight schedule. Talking to this smiling man was the shining light of navigating a bewildering Penn Station. America’s rust belt, northern New York and the Berkshires are on full display in this 24 hour trip between Boston and Chicago. When you reserve a sleeper car on this train, you'll be right next to the dining car, which is a wonderful amenity (Lakeshore Limited separates the sleepers and dining car by 10ish coach cars). We like this route because its a tour of the Megalopolis' back streets in New York, Newark, Philadelphia, Baltimore and DC, crossing some pretty spectacular bridges, too. And then you get into Virginia, which is gorgeous. From the reservation screen to check-in, it’s obvious this is one of the most bike friendly trains, and it should be, connecting Portland, Seattle and Vancouver. The water vistas from Seattle to Vancouver are beyond impressive. Tip: pay the small upgrade charge for first class seating (shown below). A double decker train that spans from Chicago to Seattle showcases the heart of the midwest, Glacier National Park and Cascade Mountains. 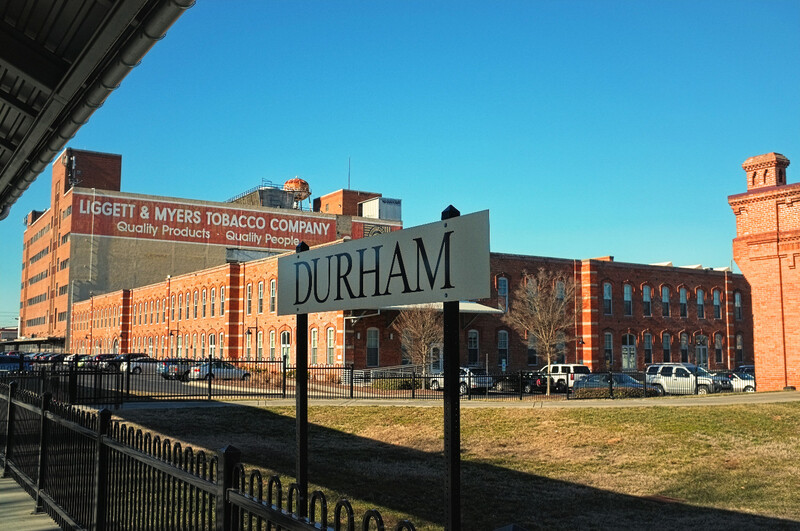 Besides being a newer train, we like this route because bikes are free between Raleigh and Durham and we remember it being truly roll-on service so you're sitting next to your bike. California Zephyr is one of the most scenic train trips. Click image for Amtrak's blog to see the other four! 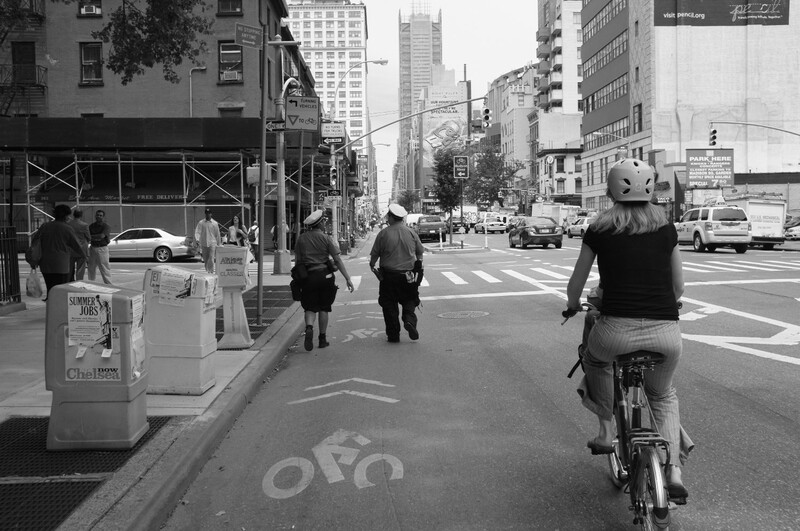 Which routes are bike friendly? We've turned Amtrak's bike policy chart into a handy map. If you value roll on service as a first class amenity, join us in cheerleading for more routes added in the near future...namely for the most bikeable city in America, Minneapolis. The San Joaquin train hosts our preferred method of roll-on service: floor racks right next to seating. Pack light. This should be a general rule for travel, but even moreso with trains. Whether you’re in coach or a sleeper, you don’t wan t to lug large or multiple bags through the aisles and then lift them up to store them. Bring snacks, especially on overnight trips. The food served in the dining car is of the microwave Sysco variety and there are no alterations accepted. Bring some non-perishables like olives, hummus, crackers, fruit, undressed salads, cheese, etc. Use layovers to grab food and stretch your legs. We’ll dedicate a whole post to this in the future including our favorite nearby restaurants and neat things to do to kill time, but for now, this will take some research and planning ahead of time. Check your itinerary to see if there are any layovers and look for pizza delivery or restaurants closeby. Once your trip is in motion, pay attention to the timing / delays and ask the conductor for the scheduled departure from the layover so you can order pizza well in advance of arriving at the station. 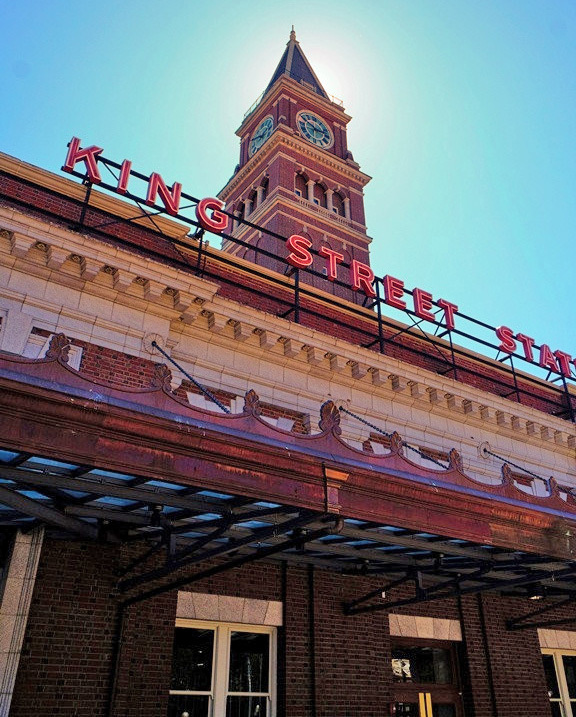 Some stations like Denver’s Union Station have gone through amazing rehabs with 3-star take-out options (and great beer & coffee) within the station. Finally, make sure you are back on the train 5 minutes before departure. You don’t want to miss it with all your stuff on board. Quiet cars. 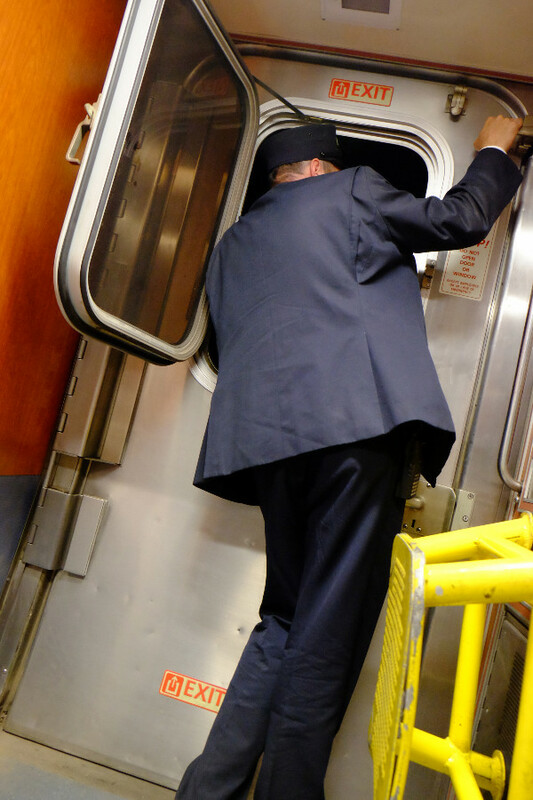 Most trains have a designated “quiet car,” where people go who want to hear and make no noise. There will be no loud kids or cell phone conversations happening in that car. Disconnect – Use the excuse of popular travel pre-1970s (and electronic devices) to read, talk, stare out the window, play cards, write, color or even knit. Make friends with staff. They can make your life really great or really miserable so try to set the tone from the beginning. On trips longer than 5 hours, spring for a sleeper car. The quiet, privacy and better sleep is well worth it. Bring a gift. Your sleeper car’s conductor will be your innkeeper, so to speak, turning down your bed, arranging your meals and getting you ice for your wine;) Bring a little something like local chocolate and we suggesting tipping. White Noise. Besides the frequent train whistles that occur west of the Appalachian Mountains (street crossings versus tunnels), the train has a lot of creaks and random noises. Bring white noise to drown some of that out. Bluetooth speaker. Having music as a soundtrack to the scenery is a lovely compliment. Just keep it on the quieter side because you have very close neighbors. Take a shower. Not the most comfortable experience, but there is definitely hot water and you’ll always remember it. Subtip: spread your feet to anchor against shower walls to balance yourself as the train rocks side to side. Amtrak provides towels, but bring toiletries. Gaming the Reservation System. There’s a weird, unspoken allowance for children in sleeper rooms. Although they technically only sleep 2, roomettes on Lakeshore Limited and Crescent routes are roomier with tall ceilings and a luggage compartment. 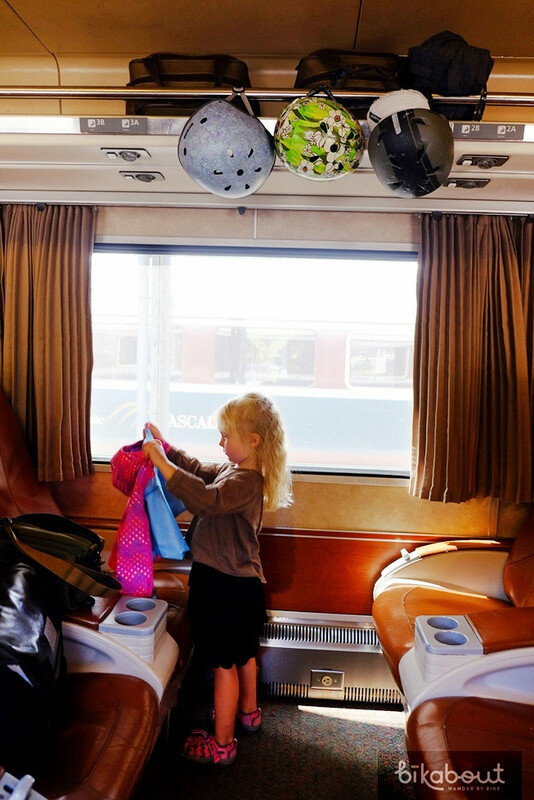 When our daughter was a toddler, we frequently reserved the roomette, made the luggage compartment into a bed and she slept there brilliantly leaving us the 2 twin beds. 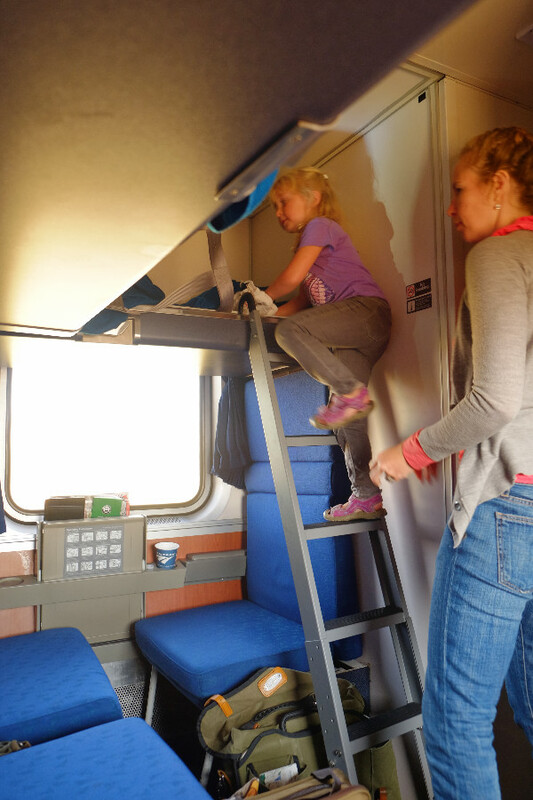 Kids have so much to look at and think about when staring out the window from the top bunk of a roomette. 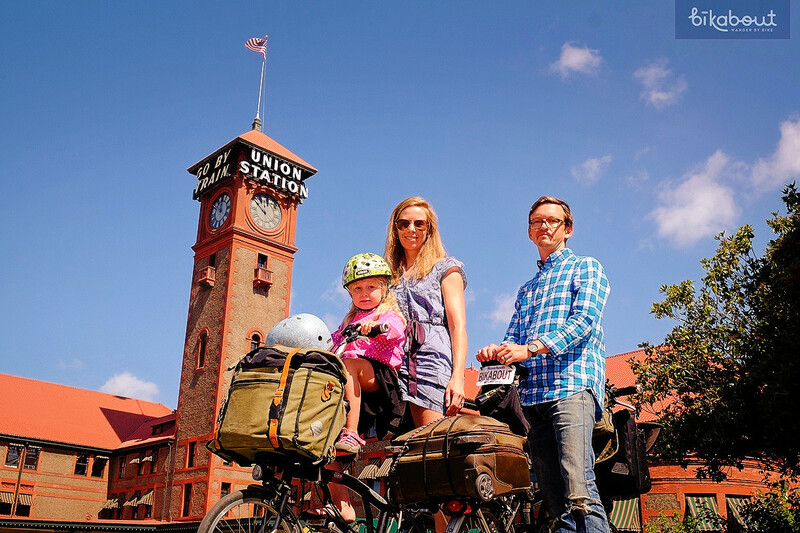 With or without your bike, book an Amtrak train soon. 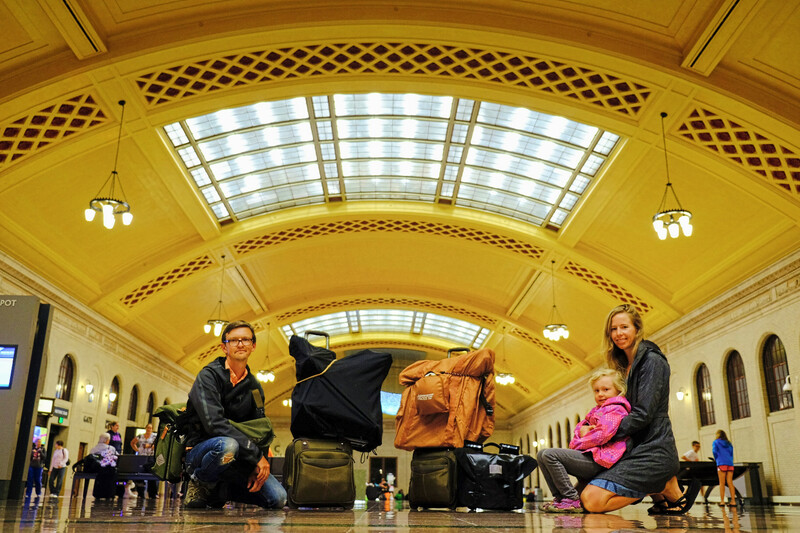 Travel by rail provides memorable bookends to your destination and we guarantee it will give you a different impression of the America you thought you knew.